Protestors (peacefully) storm the Googleplex and demand net neutrality. 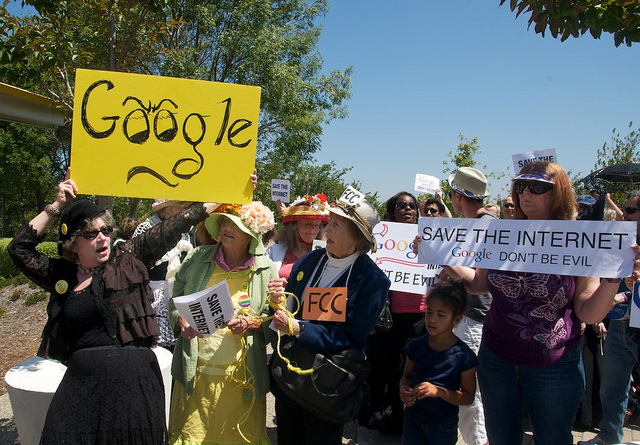 Signs from Friday’s net neutrality protest at Google are long gone, but the debate lingers. At issue is creating equal access to the Internet, regardless of site or use. The idea being, net users should be able to go anywhere online and enjoy the same connection speed and quality regardless of what they’re doing. It’s an ongoing battle and one that we’ve covered quite a bit in the past. The most recent skirmish began earlier this month when Google and Verizon crafted a set of recommendations for the FCC. The duo’s collaboration–along with their call for exempting wireless companies–rubbed a lot of people the wrong way. Hints that the two were pairing was the reason cited for a breakdown in FCC talks with industry players attempting to craft new rules. As AT&T nuzzled up to the plan Friday, opponents began organizing. And they focused their ire on Google. Credo Action, Color of Change, Free Press, the Progressive Change Campaign Committee and Moveon.org organized protesters to storm Google headquarters in Mountain View Friday. With 70 or so showing up, the noontime rally was more like a tropical squall than a full-blown hurricane, but the group did get to make their point and deliver a petition which organizers say had 300,000 signatures. Can the chickens in the henhouse all be guarded by the fox? The FCC must do its duty and protect access for all. Equal access is the key. So why Google? Well, Eric Schmidt and Co. has repeatedly stated they are committed to net neutrality. Its corporate mantra “Don’t Be Evil” would also seem to support the idea that open and equal access to the Internet is a good thing. The company’s latest move looks like a reversal, although the company blog claims otherwise. Richard Whitt, Google’s Telecom and Media Counsel in Washington, writes that teaming with Verizon has nothing, repeat nothing to do with wanting to boost Android sales. “This is a policy proposal — not a business deal,” he wrote. Perhaps, although we’re pretty sure Verizon doesn’t mind Google’s help with the FCC.